From last week, face down cards that are targeted will now be flipped face up like the red 10 in the screenshot. Cards can now be played face down (eg. the card in front of the red 10). Also the the info box is now longer and not as tall. At the moment, the front row of cards is still visible with the box open. What’s next: In regards to coding, there are some bits and pieces like disabling certain cards after battle and moving face down cards to the front after a certain time. Show/Hide hand button is also displaying the wrong text sometimes, like in the top right of the screenshot. 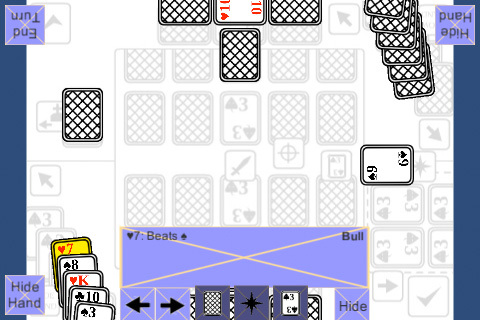 I also still need to think about the layout of discarded cards. There is also possibly a chance for some play-testing this weekend so I’d like to review the rules and make sure the physical test cards are up to date and ready to go.